I’ve been having a lot of real-life, grownup talks with friends lately. Conversations full of hugs, laughs, tears, looks of understanding and empathy, prayer. We’re all in different stages of life — some with kids, some without, some married, some single, some with or without houses, homes or Homes (that is to say, where we belong), some with broken families, families that were once broken and have been rebuilt, some with crumbling foundations and others firmly on solid ground — but at the same time, we’re all navigating this Thing They Call Your Twenties together. And all of us feel a little misled, too, that we were to believe this time would be easy, fun, carefree and inconsequential (not to say that it isn’t, sometimes). And yet, it’s seemingly the most defining part of our lives (I can’t say for sure, though, because I’m not beyond it yet). For some of us, we’re going to make mistakes. We’re going to get bruised or beaten by the pebbles, rocks and boulders life throws at us. Some of us are going to be down for the count for a while, wondering what we did wrong and figuring out how not to fall again in the future — a lesson in which some of us will succeed, some not. Some of us are going to get right back up again and keep trudging through until we get to a better place. Some of us may even breeze through this decade and have it all “figured out” — lucky them. Some of us aren’t so lucky — or maybe we are. Because we have to endure the struggles, we have to grit and bear the growing pains and when things do get easier (and they do, and they will), we are wiser and stronger than we were before. And through it all, we have good company. We have friends and family who get it. We might not have the answers, but we have shoulders to lean on in the waiting. And for me, in the quieter moments, I have the kitchen, too — just me, my oven and a few hours to measure, sift, stir, pour, bake and slice. 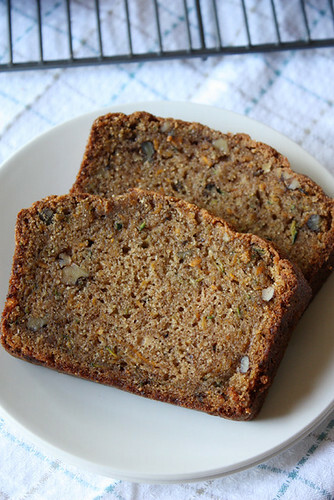 I have a crush on zucchini bread because it is steadfast. It never fails you. You can throw anything at it — walnuts, sweet potato, spices — and it can take it and make itself even better. It’s dense but not overpowering. It’s flavorful but subtle. It doesn’t take over a room, but you know it’s there just waiting to be put to good use, whether as a companion to a strong cup of coffee at breakfast, warmed and slathered with cream cheese, eaten in bits by hand for dessert or sliced, wrapped and sent off to loved ones. If there was a guidebook for this phase of life, I sure wouldn’t mind a peek at it. But I know there really isn’t one. What I do know, though, is that we’re all going to make it, each in our own ways. For me, it’ll be with a slice or two (or three) of this bread to help pick me up again when I need it. 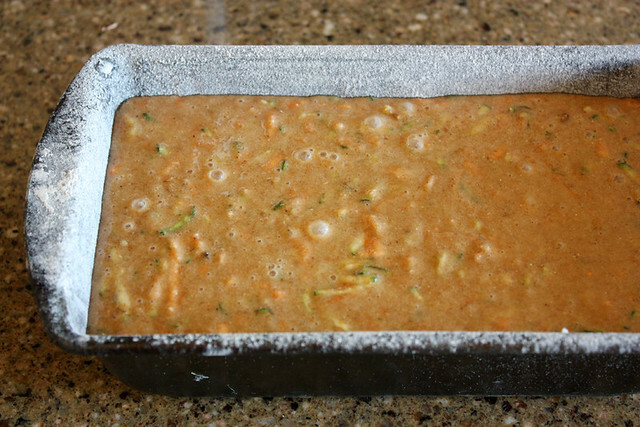 Preheat oven to 350 degrees F. Butter and flour the bottom and sides of a 9-by-5-inch loaf pan and set aside. 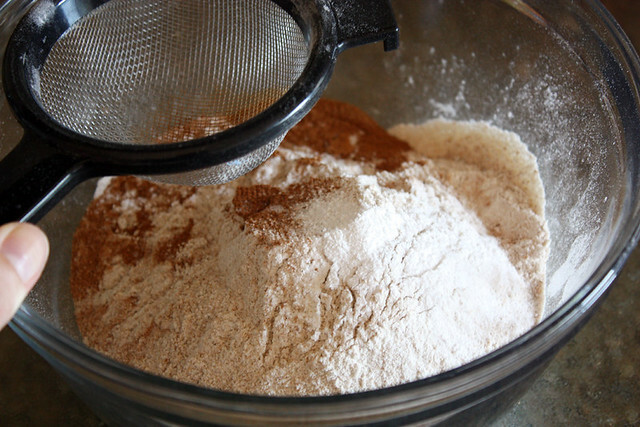 Sift together the flours, cinnamon, nutmeg, baking soda, baking powder and salt in a large bowl. In a separate large bowl (or bowl of a stand mixer), beat together the sugars, oil, eggs and vanilla. 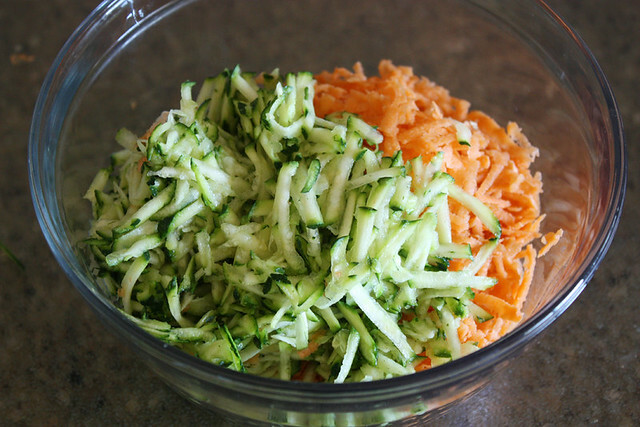 Add shredded zucchini and sweet potato and stir to combine. 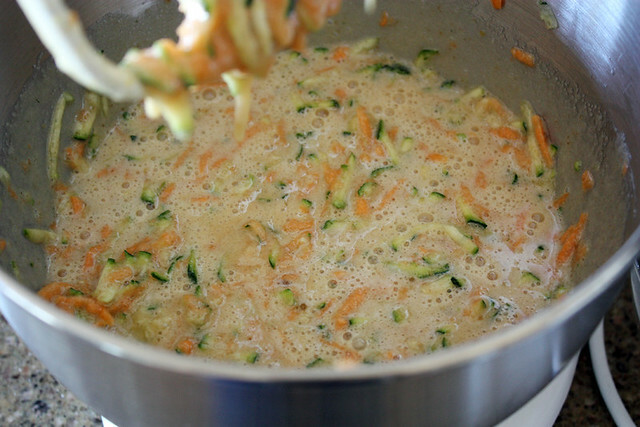 Add dry ingredients and stir until just combined. 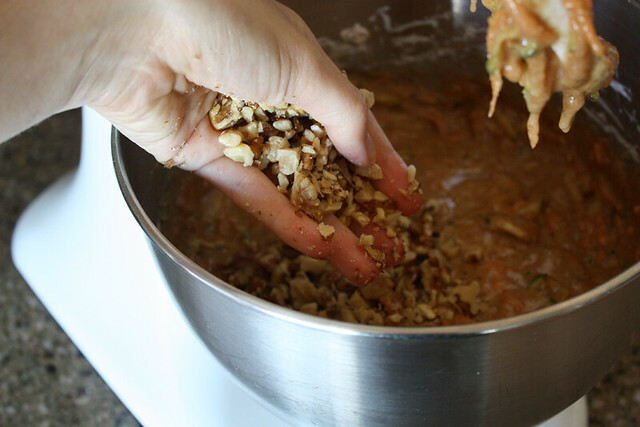 Fold in chopped walnuts, if desired. Pour batter into prepared pan and bake until a toothpick inserted in the center of the loaf comes out clean, about 1 hour 20 minutes. Halfway through baking, cover pan loosely with foil if top of loaf is browning too quickly. Remove bread from oven and cool 15 minutes in loaf pan on a cooling rack. Using a spatula or butter knife, loosen the edges of the bread and remove from loaf pan. Place bread on cooling rack and cool completely before slicing or serving. Store bread wrapped tightly in foil at room temperature for up to 3 days. This is amazing. I think I will buy some zucchini and sweet potato on the way home. I too love my time with my mixing bowls, measuring cups, spatulas, pans and my beloved oven. At first I thought you added shredded carrots, but love the sweet potato idea. Can’t wait to try it! Roxana — They do look like shredded carrots, don’t they? That would be a good thing to put in zucchini bread, too. 🙂 Thanks for the comment! Erika — It’s the best kind of motivation. 🙂 Good luck with the move! 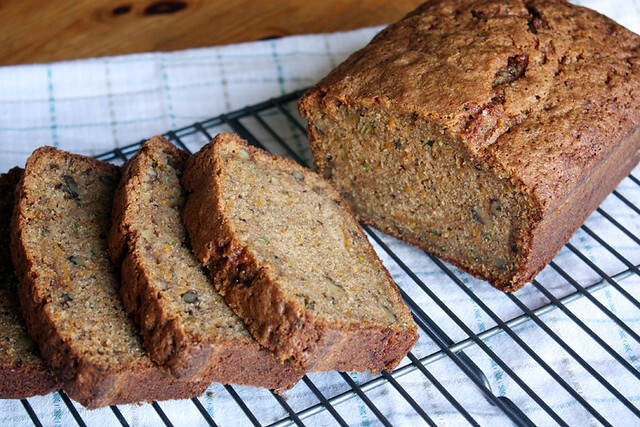 i adore how this recipe uses zucchini & sweet potato – brilliant flavours! yum! Sephanie, this sounds delicious! Do you think this could be made into a muffin recipe? Im kind of new at baking and my son needs some veggies… he loves muffins!! Wow, I feel almost like i am intruding, i am male, old (married) and fascinated with your real life comments (and of course the recipes that i can incorporate). Well for what it is worth , sincerely hope you figure it out; I have for the most part, I turn it over to someone who knows how to deal with the “issues”..:)… You can probably guess who. Hope this is not out of line on here, and again love your zeal for all these recipes! 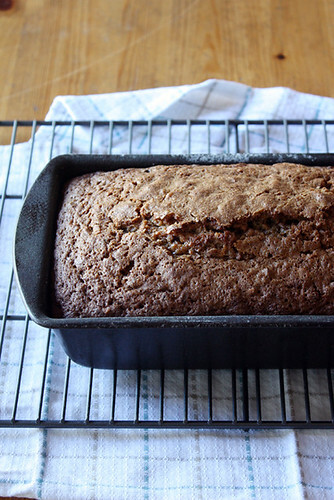 Baked this last night….it was super easy to make and the bread turned out fabulous. Very moist and tasty! I’ll definitely make it again and again and again! 🙂 Thank you! Susan — Yes, absolutely! Just let it cool completely, then wrap it in plastic wrap and foil and freeze it for up to about 3 months.